Shadwell’s early plays reveal little interest in scenery, but he seems to have made efforts with this pastoral-tragicomedy, although the text is less than explicit. More than half the play seems to take place in some sort of palace garden, but this setting is not stated and must be inferred from various references in dialogue to ‘garden’, ‘grove’, and ‘grotto’, and a single stage direction in 1.1: “Enter Endymion from behind the Arbour”. 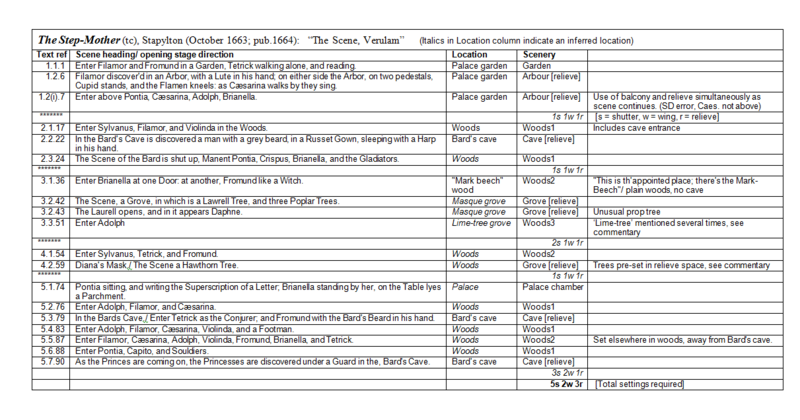 In the printed play’s preliminary material the general setting is stated to be Arcadia, suggesting that the garden scenery was possibly wilder than in other LIF productions, tending more perhaps to the “delightful Landskip” requested by Flecknoe in Love’s Kingdom. The arbour from which Endymion steps was almost certainly represented by a wing or wings, rather than anything in the relieve area. This can be deduced from a stage direction/scene heading that effectively denotes 3.2: “Scene draws, and Shepherds and Shepherdesses are discovered lying under the Shades of Trees”. As 3.2 is a relieve scene, 3.1 must be a shutter setting. The setting is not stated, but a clear ‘garden’ reference comes in 3.1, indicating that this is the same setting as used in 1.1. The reference occurs when Cleantha enters mid-scene; the King asks, “What makes you abroad so early?”, and she replies, “To take the pleasant ayre of this Garden”. The recumbent shepherds and shepherdesses of 3.2 are discovered in a brief masque-like episode similar to those in Robert Stapylton’s plays (The Slighted Maid and The Step-mother). The King and Court have assembled onstage and the masque begins once the shutters have withdrawn. The sudden switch from the garden shutters as fictional setting to their reflexive revelation as theatrical apparatus is also found in Stapylton, but is absent in more realistic plays. Shadwell supplies only two explicit statements of place out of a possible eleven: “The Scene changes to the Temple” in 4.2, and “Enter Neander, Geron, and Phronesia in Prison” in 5.3. Despite this lack of information the scenic structure of the play is clear. It requires five wing and shutter scenes – garden, temple, hall, prison, and courtyard – and one relieve scene of trees for the masque. With this arrangement one mid-act wing and shutter replacement would be needed in Act 5. This could be avoided by leaving the prison setting on for the execution, but a prison does not seem appropriate for a public execution in this period. The execution is announced by a stage direction calling for a large prop: “There appears a Scaffold cover’d with Black, and Urania led between two Gentlemen in black: The King looks to see the Execution [above]”. Since Urania is to be beheaded, rather than hanged, the height of the scaffold is less of an issue; it could either be discovered behind the prison shutters, or thrust on from the wings. As this is only Shadwell’s second play, the ambiguity might reflect some uncertainty about theatrical realisation. In his valuable study of Restoration action within the scenic area, Lee J. Martin assumes this to be a discovery, but a simple thrusting on looks the best fit with stage directions and dialogue. The brackets in the stage direction indicate that the King would have been watching from a balcony. There is only one mention of ‘door’ in the whole play. This occurs in a stage direction that follows the oppositional pattern: after a marked ‘exeunt’, several characters are directed to “Enter at the other door”. Ibid. p.71, brackets in text. See, ‘Action Within The Scene On The English Restoration Stage’, unpublished doctoral dissertation, Stanford, 1956, p.181. ‘There appears’/’appeares’ is a not an uncommon direction in pre-Restoration masques to indicate a discovery of some sort, but according to the LION database this is the only incidence of the term within the period of this study. Dryden’s jibe – “there is no Scene in the first Act, which might not by as good reason be in the fifth” – is more witty than true, but it must be admitted The Slighted Maid is at times confusing to read. Despite Dryden, however, and despite Pepys’s judgement – “not very excellent” – it probably played better than it reads. The plot may be overly intricate, but at its best the play is theatrically diverting and makes intriguing use of stock romance devices; not the least being that the eponymous heroine (believed dead) should spend so much of the play in a position of some power disguised as her vengeful and apparently vicious brother. 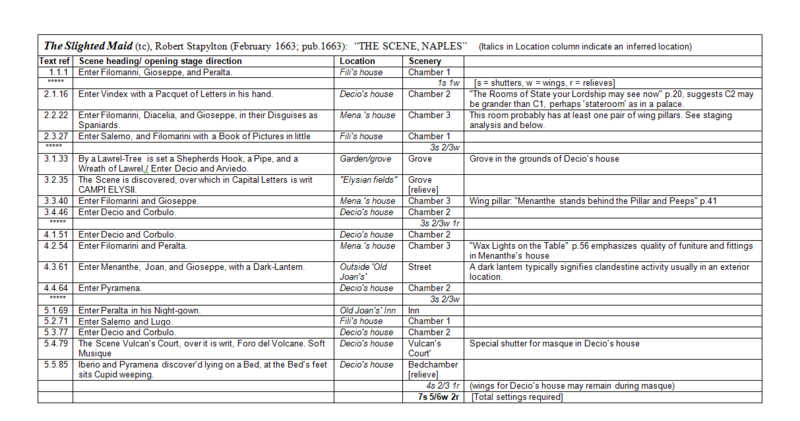 The text numbers acts but not scenes (my numbers below) and Stapylton provides little explicit scenic information; however, he consistently uses a cleared stage to mark scene divisions, there are ample stage directions, and for the majority of scenes the dialogue provides clear indication of locale. This clarity enables a fairly confident reconstruction of the scenery plot. The Scene is discovered, over which in Capital Letters is writ CAMPI ELYSII. The Shepheardesses lying arm in arm. As several commentators have noted, it is difficult to decide what exactly is being shown here: a painted shutter, a relieve scene, or a relieve scene with live actors? Indeed, given the flickering, uncertain quality of the original lighting Arviedo probably speaks for the LIF audience when he asks, “Is’t Life? Or Art”. The answer appears to be both, for two lines later Decio commands, “Rise, dull Sleepers” and the bucolic lovers, “dance and go off”. Almost certainly then, the scene is a composite of painted relieve elements and reclining actors, exploiting, as in the Caroline masque, the discovery’s potential for charm. On cue the actors then arise, dance on the main scenic stage, and exit through the wings. More puzzling is the position of the scenic surtitle. It obviously cannot be painted on the backshutters, because the surtitle appears at the same time as the scene is discovered. There are four possibilities: it might have been painted on the backcloth, on a relieve element, on an upper backshutter, or on a border. Visibility is the limiting factor here. Although any legend painted on the backcloth probably could be illuminated by lights offstage or fixed to the closest relieve element, the text would perhaps be too distant to make the impact implied by the stage direction. The term ‘over which’ implies separation and this certainly could be achieved by changing the final border for one bearing the legend (at the same time as the discovery). However, visibility would again be an issue, as borders cannot be seen by all; as Richard Southern puts it, they exist “only for the benefit of the spectators in the lower and nearer parts of the house”. In addition, there is no evidence for changeable borders in this period. The same difficulty arises with upper shutters, as the only LIF play where the use of upper shutters may be a possibility is the much later Cambyses (1671). Moreover, using upper shutters to reveal a surtitle smacks of the sledgehammer approach to a nut, which leaves the possibility of a sign in the relieve area. This seems the best solution as there would be plenty of time to get it into position and it could be attached to the top of the first relieve, or if, as seems likely here, that was not possible, it could simply hang from an attachment at or above the rear of the backshutter frame. The second masque episode is non-scenic. It largely comprises a dance involving Jack-a-Lantern and a group of reapers and is discussed in my article “Scaenes with four Doors”: Real and Virtual Doors on Early Restoration Stages. The third episode is the most interesting: it is dramatically integral and inverts the fatal consequences of the Jacobean masque-in-a-play trope. Scenically it begins with another surtitle, this time less puzzling as the legend can be painted on the backshutters: “The Scene Vulcan’s Court, over it is writ, Foro del Volcane”. The discovery occurs several pages later: “Iberio and Pyramena discover’d lying on a Bed, at the Bed’s feet sits Cupid weeping”; again this is a carefully composed static, indeed emblematic, picture. This is a tragicomedy, however, and the couple are merely drugged. They wake up, are unbound, and bidden to witness the final discovery, that of the Slighted Maid herself: “Decio puts of his Night-gown, & discovers himself to be a Woman”. ‘Follow that!’ might be a contemporary response to such a direction, but there is one final scenic point to be made. In 3.2 occurs the following dialogue and stage direction: “Diacelia: Patience, Madam,/ I may mistake, believe your eyes,/ That Pillar will obscure you./ Menanthe: Good, good Girl./ Menanthe stands behind the Pillar and Peeps”. As with the tree in the previous scene, a wing is almost certainly being used here. Unlike on some earlier stages, the Globe being the obvious example, there were no stage pillars supporting the heavens to hide behind at LIF. Again, there is no need here for a practical pillar to bear weight, and thrusting on scenic prop pillars in the brief interval of a cleared stage between 3.1 and 3.2 would be ludicrous. The setting is the con-woman Menanthe’s house, which seems unusual, as Menanthe is not of the social class habituated to pillars in its domestic arrangements; however, the point is explicitly made early in the play that Menanthe is not only vicious, she is a social climber. When asked by old Filomarini where his son met her, his friend Gioseppe replies, “At Church, with the Greek Cheater cursed Mother,/ That passes here for an illustrious Lady;/ The Vice-Roy heard she was a Grecian Princess”. The pillar/wing not only furnishes a handy place from which to peep, it also signifies Menanthe’s would-be status; note also the use of the scenic stage for acting purposes. The quality of furniture and fittings in Menanthe’s house is emphasized by a stage direction whose import may escape modern readers: “Wax Lights on the Table”. Wax lights offered the clearest and highest quality light and were considerably more expensive than other forms of lighting. Diary, Feb. 29, 1663. On July 28, 1668 Pepys saw it again and thought it “but a mean play”, but he was troubled with his eyes at this time and not disposed to much enjoyment. London: Thomas Dring, 1663, p.33. Changeable Scenery, London: Faber & Faber, 1952, p.155. A little later in the play these wax lights (probably white wax, the highest quality) are used as an index of social status when one character compares them to the taper she holds: “The Taper better suits my Fortune, Sir” (Ibid. p.58). Eleanor Boswell reproduces a Lord Steward’s account (The Restoration Court Stage, New York: Benjamin Blom, 1965 , p.97, n.3) that shows how lighting was apportioned in a Court theatre production. The King’s Presence and Privy chambers receive white wax lights, a privilege also accorded the branches and sconces in the auditorium, the ‘scenes’ and musicians receive yellow wax, while the Gentlemen Ushers, Yeomen of the Guard, grooms, and porters make do with torches and tallow.